Audio book published by AudioGO Ltd.
A nominee for the Man Booker prize. lines between old and new inhabitants are drawn. I should note first of all that this is not strictly crime fiction although it is based on Australia’s convict (criminal) past and the main characters are felons, and murder does occur. What it does do for the reader is give a pretty authentic portrayal of early 19th century New South Wales, a harsh penal colony. It gives a snapshot, in a “no holds barred” sort of way, of a convict, ticket of leave, family who pioneer life on the Hawkesbury River and eventually begin to call New South Wales home. I say it is authentic because it has all the features of research well done and resonates with what I know of colonial history, but also tells me a little more. It highlights 19th century beliefs about the aboriginal population whom the authorities did not regard as owning the land because they didn’t farm the soil. It illustrates the resultant conflict between the aborigines and the convict/emancipist settlers on what was then the frontier of the colony. The reading experience is made all the more enjoyable by the excellent narration skills of Bill Wallis. I read almost exclusively crime fiction and decided that this year I would challenge myself to read outside the genre occasionally. This is the first one I’m managed. 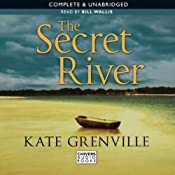 THE SECRET RIVER is the first of a trilogy set in early Australia. It was shortlisted for the Miles Franklin Award and the Man Booker Prize and longlisted for the IMPAC Dublin prize.